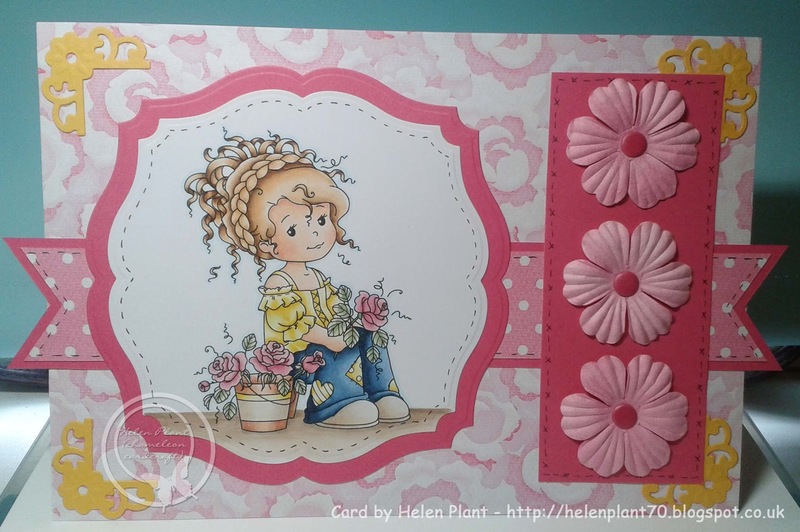 I made this card using another of the Wee Digi stamps, they are just so cute, can't resist. What a lovely card Helen, your coloring of the image is fabulous. Thank you for leaving your comment, it is very much appreciated. Hi, my name is Helen and I am 42. I live with my partner, 3 children, nanny to my 2 beautiful grandchildren, cats, rabbits and a hamster - feels like a zoo sometimes !!! In my spare time I enjoy making my own cards, I started doing this about 13 years ago. I have tried lots of techniques but my favourite will always be stamping, it is my passion. I especially love digital stamps as you can resize, flip etc, you can really have a play around with them. I like to colour with alcohol pens but do sometimes use other mediums. I am rather addicted to ribbons, papers and embellishments - aren't we all !!! I just enjoy creating and hope you do too, have fun !!! Challenges I have won or made top 3 or 5.